Having Bar Graphs solution downloaded from ConceptDraw STORE software — a new product of CS Odessa — can simplify your work with creating any needed bar graphs, as it can provide all ConceptDraw DIAGRAM users with the necessary tools for making great looking drawings: graphic elements to use, pre-made templates of the bar charts, etc. “Bar graph” and “bar chart” are known to be identical terms, used for explaining and describing such drawings where everyone can present the categorical data with the usage of the rectangular bars, where their heights or lengths are proportional to the values they are representing. The bars can be plotted either horizontally or vertically, but any vertical bar chart is also sometimes known to be called as a “line graph”, instead of “bar graph”. Any bar graph can show the comparisons among some particular discrete categories. One axis of the chart is known to be showing the specific categories which are being compared. At the same time, the other axis can represent some measured value that has to be illustrated. Some of the bar graphs are known to be presenting the bars which are clustered in groups of more than one. Such graphs are used for showing the values of some measured variable, which is not only one, but more than one. The usage of the bar graphs is known to be worldwide. They seem to be one of the most commonly used graphs, with the help of which it becomes much simpler to show how one. The term "graph" can be replaced with another one — “chart”, especially describing the bar graphs, which are also known as simply “bar charts”. The mentioned term is known to be having many different meanings. For example, a “data chart” is another of the numerous types of graphs, apart from bar one, used for making it simpler to arrange as well as to represent any qualitative and/or numerical data. Sometimes maps also consist a lot of different information, depending on the specific purpose. Maps can also be called as “charts”: for instance, “nautical” or “aeronautical” ones. Charts or graphs in general are used for making it much simpler to understand some large quantities of data. It helps illustrate such data in a way of representing the relationships between a few different parts of the same data. Graphs or charts can be understood more quickly as well as more easily to compare to the raw data mentioned in a way of text, for example. In most of the cases, charts/graphs are used in lots of different fields of business activities so everyone can create them either by hand or using a computer. 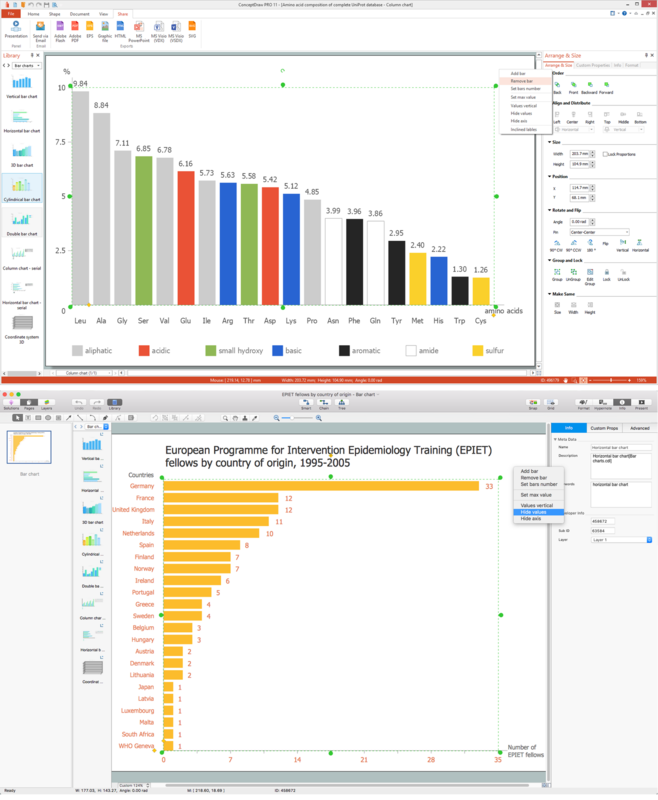 With ConceptDraw DIAGRAM diagramming and drawing software downloaded from this site as well as Bar Graphs Solution (from the ConceptDraw STORE) you can simplify your task of making a great looking as well as professionally looking bar graphs and bar charts within only a few minutes. Thinking about what exactly to use for representing your data, you can always consider at least one type of charts, such as bar one, for example. Depending on the specification of your data, you can always use any solution available for all the ConceptDraw DIAGRAM users in ConceptDraw STORE to illustrate the needed information. Some of the types of the charts can be more useful in some definite case comparing them to the others. Each of the charts can represent a large amount of data in many different forms, but still leaving some common features, providing those graphs with their ability to extract the needed meaning. Almost any kind of data can be always represented in a graphical form, simplifying its understanding. With the aid of using the bar graphs it becomes much more clear what the comparison is all about for those who are meant to be seeing that chart. Generally, it is known to be easier for people to infer any meaning from such illustrations, as some meanings are usually more difficult to get from the boring text with no images or obvious structure. It is good that there are many types of charts to choose from. Any of the can be used for your data representation and all of them can be found within our solutions. Thus, being a chart or graph, that presents the grouped data in a way of using the so-called “bars” (shapes of rectangles), bar charts can be completed within a short period of time while working in ConceptDraw DIAGRAM using the Bar Graphs solution. The lengths of the bar charts are known to be proportional to the values they represent and the bars - plotted in a vertical or horizontal way. The so-called “vertical bar charts” (also known as “Line graphs”) can be also always created with the help of ConceptDraw DIAGRAM diagramming and drawing software, using the needed solution for simplifying the work of drawing it. You can always use the bar graphs for more complex comparisons of data making the grouped bar graphs and/or the stacked bar graphs. The grouped bar chart is known to be having two or more than two bars within it used for each of the categorical groups. The mentioned vertical bar chart is usually made as a colour-coded one so it is easier to represent some particular grouping. For instance, having a retailing business with two supermarkets involved, you can make a grouped bar chart using different colours for your “bars” within the chart for representing each of them — the data about its income, growth in customers, etc. Thus, the horizontal axis within such chart can show the years and the vertical axis can show your revenue. 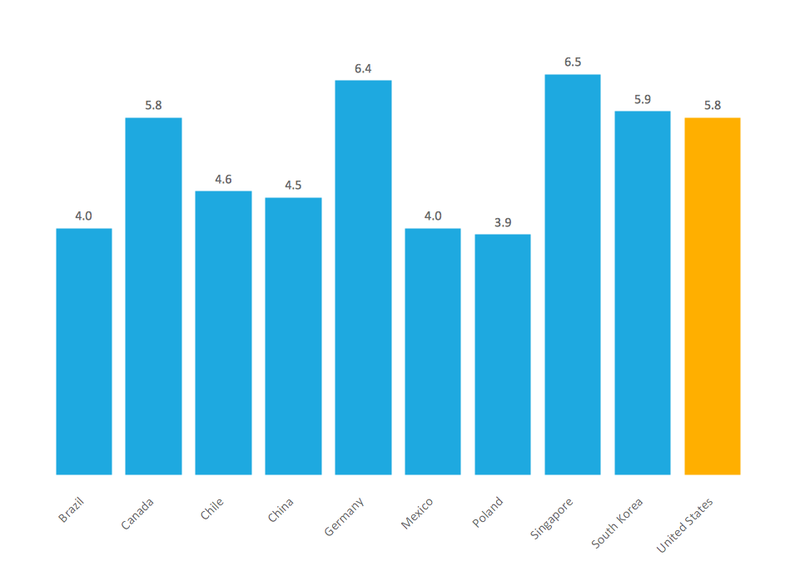 A stacked bar chart can also be used for representing different groups of goods which are popular with the customers, for example. You can also make a grouped bar graph for representing the information in the same order in each of the groupings. To get the needed great looking result within only a few minutes, having all of the necessary tools available for your use, you can always get the mentioned “Bar Graphs solution” that provides all of the needed templates and samples of the pre-made graphs and charts, as well as a library full of vector stencils for quick and simple drawing of bar and column charts/graphs. How do you make a histogram usually? Drawing of histogram is quite complex and lengthy process. Usually you have a set of data and you draw free-hand your diagram according to these data. But now thanks to the ConceptDraw DIAGRAM v12 diagramming and vector drawing software extended with Histograms solution from the Graphs and Charts Area of ConceptDraw Solution Park this process became simple and fast. Picture: How Do You Make a Histogram?